Local and State building trades leaders praised Democrat Mayor Andrew Ginther for vastly improving the relationship between the City of Columbus and the Columbus/Central Ohio Building Trades. Ginther, 43, will have the opportunity to further improve that relationship, as he will not face a challenger for his current seat. According to the Franklin County Board of Elections, Ginther submitted more than 3,000 signatures on Feb. 4. He needed to submit at least 1,000 valid signatures to get on the ballot. No one else submitted signatures by the Feb. 6 deadline, which means Ginther will run unopposed this fall for a second term. “As your mayor, I’ve focused on expanding opportunity for every person in every neighborhood. 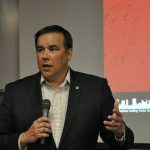 I’m asking for your support again to continue building a bold, progressive future for the city I love,” Ginther said in a written statement to The Columbus Dispatch. 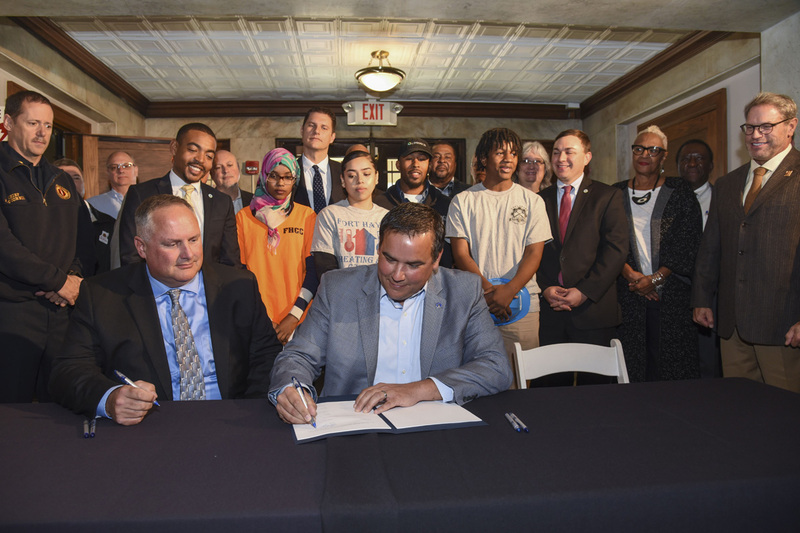 The Columbus/Central Ohio Building and Construction Trades Council has worked with Ginther on a variety of initiatives to put members to work and help promote apprenticeships throughout the community. According to Dorsey Hager, Executive Secretary-Treasurer of the Columbus/Central Ohio Building and Construction Trades Council, the relationship between the city and Columbus/Central Ohio Building Trades has greatly improved during Ginther’s first term. Hager said Ginther understands the issues important to the building trades and their affiliated members. 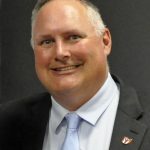 He believes in Prevailing Wage, the use of Project Labor Agreements/Community Benefit Agreements and is against So-Called “Right to Work” legislation. 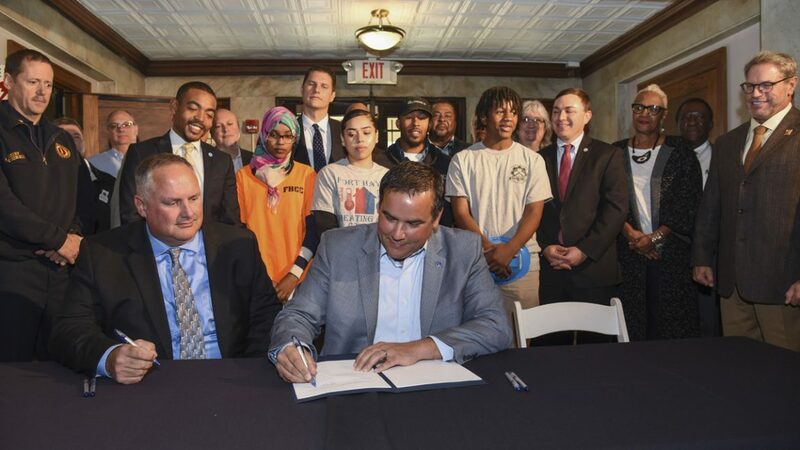 Under Ginther, the city has signed three Community Benefits Agreements to work on city projects. Prior to 2017, Columbus had never utilized a PLA or Community Benefit Agreement on any city project. The first Community Benefits Agreement was signed in 2017 to build Fire Station No. 35. As part of the Community Benefits Agreement, which is similar to a Project Labor Agreement, highly skilled and highly trained tradesmen and tradeswomen who live in Franklin County or adjacent counties must complete at least 25 percent of total project work hours, while Columbus residents must complete 20 percent or more of the total project work hours. Under the Fire Station No. 35 Community Benefits Agreement, the C/COBCTC and its affiliated unions agreed to host at minimum of eight apprenticeship recruitment events in eight designated CelebrateOne neighborhoods in Columbus. Several events have taken place and more are scheduled. The Community Benefits Agreement also required the C/COBCTC to help the advancement of minorities, women and low-income residents in the building trades. The Columbus Building Futures Program, a 12-week program to provide underserved residents with the skills needed to begin a career in the region’s booming construction industry, met this requirement. Other Community Benefits Agreements were signed to construct the Linden Recreation Center and a repurposed sports complex. 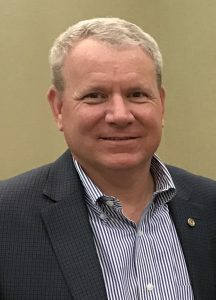 Ohio State Building and Construction Trades Council Secretary-Treasurer Mike Knisley. Mike Knisley, Secretary-Treasurer of the Ohio State Building and Construction Trades Council believes Ginther’s inclusive approach to economic growth is the secret to the success of Columbus, which has grown to become the 14th largest metropolitan region in the nation. Ginther’s administration has also worked with the C/COBCTC to promote apprenticeships in coordination with the Columbus City School District. The administration, school district and C/COBCTC are also in the process of creating a pilot program geared to educate middle school and high school students on the benefits of joining an apprenticeship. Upon completion of this pilot program, graduating high school seniors will be able to join a registered apprenticeship program. With Ginther running unopposed, Hager expects more jobs for his affiliated members through additional work agreements with the city. “He continues to be a great partner and promoter of the building trades,” said Hager. “We are working together to give underserved members of our community an opportunity to provide for themselves and their families.